The Adobe After Effects software will enable you to create compelling motion graphics and blockbuster visual effects with flexible tools that help save you time and deliver unparalleled creative power. Craft sophisticated, professional animations that can be rendered as FLV files for your website. 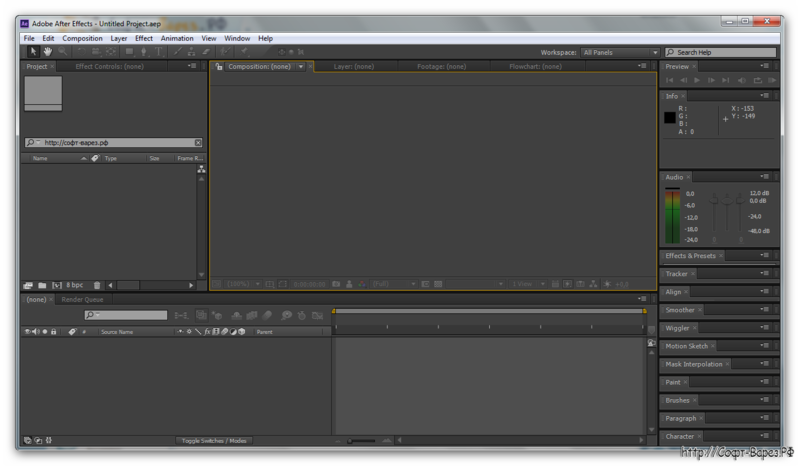 Or import your entire composition into Adobe Flash® Professional, where you can add interactivity. • Take full advantage of metadata at every level of your project: Retain asset metadata while you work in Adobe After Effects. Add new project-, comp-, and layer-level metadata to streamline project tracking, and automate asset auditing and many other tasks. • More easily track the motion of elements with Mocha for Adobe After Effects: Use this powerful 2.5D planar tracking application from Imagineer Systems to track the motion of elements — even in challenging shots where elements move offscreen or where there is motion blur or excessive grain. • Discover more flexibility and control in 3D modeling: Composite in 3D space more easily - Keyframe x, y, and z position values separately, and use the new unified camera, which makes cameras in After Effects work more like those in 3D modeling applications. • Smooth your workflow in dozens of ways: Work more efficiently thanks to numerous improvements suggested by After Effects users. These include the Auto Resolution setting that renders only visible pixels when zooming in a comp view, streamlined memory and multicore processing preferences, longer layer names, and more. • Set up projects automatically for mobile device authoring: Select devices in Adobe Device Central and automatically set up an After Effects project that targets those devices, with settings that match the targeted devices and the Render Queue setup to output to the proper codecs and resolutions. • Global Performance Cache: Create more in less time. With new Global Performance Cache, your previews are saved and ready when you are — no more waiting for the application to catch up. This revolution "under the hood" makes After Effects extremely fast and responsive by taking full advantage of the power of your computer’s hardware for visual effects and motion graphics. • 3D Camera Tracker: Track 3D elements with complete control over depth of field, shadows, and reflections. Automatically analyze and place 3D track points onto 2D footage in the background while you work. • Ray-traced, extruded text and shapes: Extrude fully ray-traced text and shapes natively and take full advantage of reflections, environment maps, and more. • Variable mask feathering: Create a separate set of splines to precisely control mask feathering. Get the exact shape you want with the proper degree of softness at any point along the mask edge, resulting in a big boost to creative flexibility. • Integration with Adobe Illustrator: Instantly convert Illustrator vector art (AI and EPS format) into shape layers. Easily animate vector art in 2D or extrude to 3D. • Rolling Shutter Repair: Remove rolling shutter artifacts such as skew and wobble without forcing stabilization. • New and updated effects: Enhance your creativity with 90 new and updated built-in effects, including the complete 16- and 32-bit CycoreFX HD suite. • Avid AAF and FCP 7 XML file import with Pro Import AE: Import and work with files created in Apple Final Cut Pro 7 or earlier versions, as well as Avid Media Composer and Symphony, letting you integrate After Effects with professional production workflows. • mocha for After Effects CS6: Launch mocha for After Effects CS6 directly within After Effects CS6.